At A&D Stars we maintain a positive discipline policy which focuses on prevention, redirection, love, consistency, and firmness. We see conflicts as opportunities to teach and learn valuable social skills. We teach children how to solve problems and manage conflicts in peaceful and productive ways, rather than punish them for having problems they cannot solve. We practice preventive interventions by creating a structured and predictable learning environment that helps to prevent behavioral difficulties and lessen the need for disciplinary action. Our teachers model positive behavior for children and show them how to approach problems, how to treat other people, and how to deal with feelings. We set clear and developmentally appropriate guidelines that revolve around concerns for the safety of all children and make the children aware of behavioral expectations. We show respect to students by listening to them and showing them that we care about things that are important to them. We encourage respectful behavior and praise students when they show respect. We encourage expression of thoughts and feelings productively, and avoid inappropriate verbal or physical actions. When a child is frustrated or mad, teachers will engage the individual in conversation and actively listen to the feelings and thoughts, expresses empathy and validation of feelings. The sense of safety and security afforded by positive relationship with teachers will help children learn to regulate their own behavior. Positive reinforcement is used to take children’s attention away from unacceptable behaviors to desired behaviors. Reinforcement will be given immediately following a behavior to increase the likelihood of the behavior occurring again, and thus improve student motivations and performance. We do not use punishment, intimidation, yelling, humiliation, guilt or other things that can hurt the children, their self-esteem, emotional growth, or relationship with the teacher. If a child is displaying persistent, unacceptable behavior, we will take steps to help the child gain self-control. We will first provide clear explanations as to why specific behavior is inappropriate and help him to find an alternative behavior that fits within classroom guidelines. If the behavior continues, we will attempt to help the child understand the gravity of the behavior, re-direct the child to activities that hold the child’s attention (the choice is made with the child), and develop other possible alternatives for helping the child gain acceptable control of his/her behavior. If the problem persists, we will contact the child’s parents for suggestions on measures to take to extinguish the behavior. The parents will be informed that if the measures do not work, the child may have to be removed from the program. The goal is to help the child strengthen his/her skills of self-control. We always remember that young children have not yet mastered the complex life skills of expressing strong emotions, resolving social problems peacefully, and getting along with others. 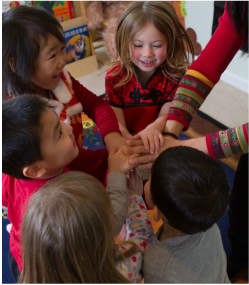 We believe that Early Childhood Educators must lovingly guide and redirect children to help them to learn to cooperate with their peers and provide positive, educational experiences to encourage and enhance their growth and development while in attendance.